In 1963, a young Blackburnian and keen photographer by the name of John Eddleston, had bought himself a new camera which he was going to take with him on a forthcoming trip to Europe. 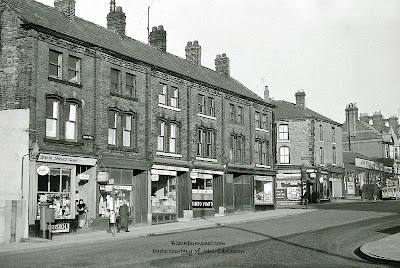 He decided to familiarise himself with his purchase by traipsing around the town (mainly the centre) taking shots of a Blackburn that would soon disappear in the planned, phased redevelopment. He took hundreds of photos and has left us with a very important archive of that period of Blackburn's history. In the late 1990's, most of John's photos were published in two small books, which were sold locally and the proceeds used to buy equipment for The Stroke Rehabilitation Ward at Queens Park Hospital (Royal Blackburn as it is now). Quite a few people were instrumental in the publication of these books, Peter Street, Ray Hull, Simon Allen, the printer John Brown and no doubt others too. My personal thanks to them all. Over the last few years, I have seen John Eddleston's photos crop up on Facebook, Flickr, Twitter, Youtube and other web-sites and rarely, if ever, is the man given a mention. Not only do they fail to mention the photographer, but often, their reproductions of his work are bad, indeed sometimes awful scans that add insult to injury (please see the example below). Here, by giving him his own category, I hope to rectify that. Over time I will upload all of his published images. They will be in pretty random order, but I will tag them by location, so if you just want to see some photos of a particular street / road, click on the appropriate one in the 'LABELS' list. If you would just like to view JE's photos, then click on his name in the same list. The same image as it appeared on a Facebook group and hand on heart, I did nothing but download it from that group. As mentioned above, an insult to the photographer. I once rode my bike through here and I totally ignored the policemans "Stop hand Signal" in order to catch my mates up who where riding a fair way ahead of me and I got the biggest rollicking of my life off him, so every time I went that way again I got off my bike about 50 yards away and pushed it through the junction ! Cheers John. I'm hoping to get them all on in time, but as I mentioned to Lorcan, quite a few of them need a little cleaning up first. It's nothing much on any of them, just specs of dust that have accumulated on the edges of the slides and the odd stain here and there. Some I'm leaving exactly as they are, as cleaning them is too tricky (for me anyway). Nice story with regards the bike and the policeman. The clarity difference here is what I've mentioned before about the books. The original photo is crystal clear, and I know the Facebook photograph is a scan of the book, but it's not really that much worse than what appears in the book (okay, it is quite a bit). It'd be great for these books to be republished at a resolution that did John justice. I am currently organising an event to raise funds for a local charity East lancs Hospice , the theme of the event is Blackburn through the ages, 80's and 90's. 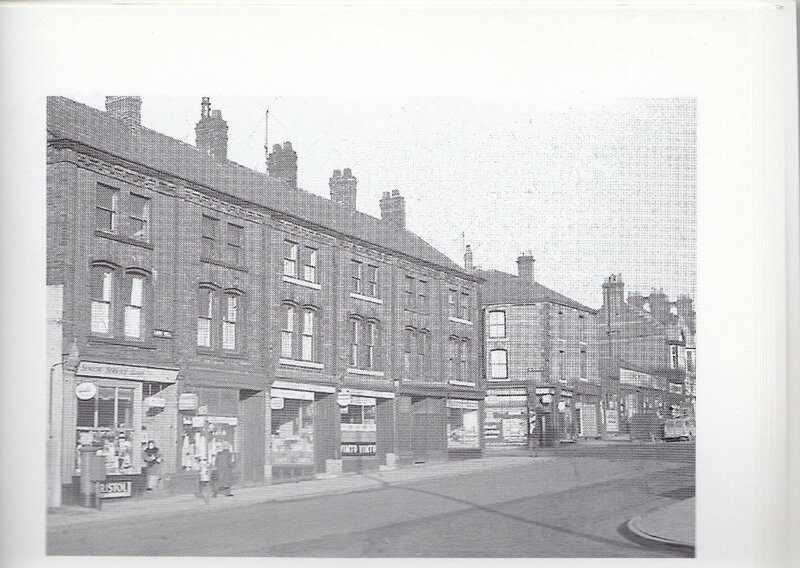 I am looking for photos of the retail history of Blackburn to exhibit. Please could help me or support me in anyway or direct me to where I could find some to exhibit on the night. You'll find that all the photos on here will be much older than the 80's and 90's. All I could suggest is that you try the central library for photos and I'm sure if you contact the right people in the Town Hall, they could direct you to the right bodies involved in retail, the Chamber of Trade or whatever they might be called these days. Hello my Grandparent's owned the Cosy Cafe, 5 Larkhill. I dont know exact dates but during 1960's and 70's. I lived there too from 1969 for 7 years. Their name was Gleave. The photo is good i can see Conway's chemist. I dont remember the post office, it was an antique shop. I'm really pleased to have found your pages. I remember the chippy / cafe quite well, as I spent the first 9 years of my life living just around the corner (Caton St, off Regent St). Even after we had moved away to Shear Brow in 1967, I still spent much of my time hanging around that area. When I left school in 1974, my first job was at ELCB across from Notre Dame convent and I was at college for 1 day a week (Friday) and we used to have to collect our wages from ELCB each Friday lunchtime. After collecting our wages, we would sometimes have our lunch in the Cosy Cafe before returning to college. We rarely referred to it as 'the Cosy Cafe', it was always just 'Gleave's chippy' to us. I always remember the chemist as being Holt's. Maybe the Conway's you mention came after Holt's left. I know your grandparents had a son, Phil. I didn't really know him, as he was quite a few years older than me. I just knew him by sight. Have a look through the other Eddleston photos, as I think there's a couple of others that catch a glimpse of that section of Lark Hill, though admittedly, the one above is probably the best of them. Hi - I'm Clare Julie's sister. Holt's chemist was owned by Conway Holt. I remember the post office vaguely but the 2 shops either side of us changed hands several times. i lived with my grandparents Norman and Ethel Gleave till the early 80's and by that time the post office and shop next door were demolished and i remember a mural being painted on our outside wall of which my bedroom was inside wall. by that time the building was old and we were being pressured to move out as i think the plans for what is now Barbara Castle way were being made. i see you refer to Larkhill Terrace but both my mum and i seem to remember it as Primrose Terrace - i'm not sure if we are correct or not. 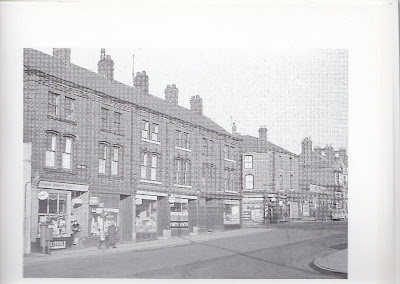 i also remember Kay and Ramskill 'supermarket' on the other corner of Regent St and the other shops further up Larkhill such as Seddons, home of Parallet trousers and Birmingham bags!! it was such i busy pedestrian area. How times have changed! Happy Days! Phil is my uncle and still lives in Blackburn. Hi Clare -- I never knew the Christian name of Mr Holt, so got confused when your sister referred to Conway's chemist. I only ever knew it as Holt's. There's a photo on Cottontown of the mural they painted on the side of your bedroom, it's a colour photo too from what I can remember. Yeah it would have been to construct Barbara Castle Way that they wanted you out. Lark Hill Terrace was the elevated run of houses facing Seddon's etc (where the concrete embankment still is). Primrose Bank is the one that ran off the top end of it, by St Alban's church and ran across to Trinity St.
Primrose Bank is still there, it's where the clinic / health centre is. Nice to hear your memories of that area. I used to buy sweets at the post office/sweet shop on my way home from the Convent, which I attended 1969-76. By the time I was in the 6th form, almost all of the houses to the west of Penny St/Whalley New Road had been demolished. A tin advertising sign that I found in the rubble ('Watson's Matchless Cleanser is the Best Soap for All Purposes!') now adorns my kitchen counter here in Los Angeles. I never thought I'd see that sweet-shop again, though. Thank you! Your sign sounds like a good find. I've just had a quick Google and from the ones I've seen, it could have at one time been set into the back of a chair (an advertising chair). 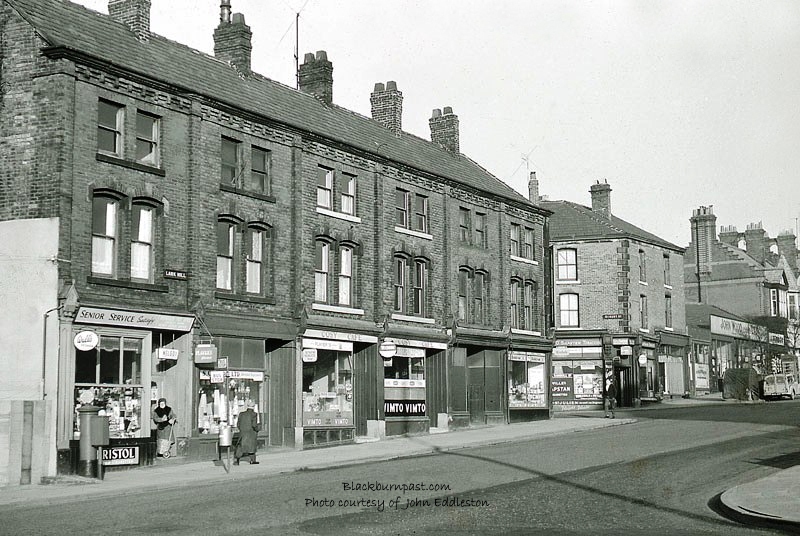 There's quite a few of John Eddleston's photos that caught different parts of Penny St and Lark Hill, so have a look through the others on here and you may recognise some more shops. I've seen some of Eddlestones 60s photos on facebook recently in colour. Are some of yours coloured or are they all black and white. As far as I'm aware, there's only one published photograph of John Eddleston's that is in colour. It's the one of St Alban's church parade / walk on Brookhouse Lane (it's on here somewhere I think). I've seen the images on Facebook that I think you are referring to. They're not genuine colour photographs. They've just been played about with, with an editing tool. They're the images you'll find elsewhere on here, with a splash of colour highlighting bits of them. It will be some plonker who received Photoshop CC or similar for Christmas and is now ruining as many photographs that they can lay their hands on. It's a bit like a kid with a box of crayons. They've also used the 'sketch' mode on some images, which makes a photo look like it's a drawing. There's nothing artistic or clever about it, it's all done with the click of a button. Many of the camera's on the latest Smartphones have the facility to manipulate / corrupt images. I saw a photo of the Rolling Stones on a website a couple of years ago that had been 'colour enhanced'. It's a photo I've been looking at in books for the last 40 years or more and it was always in Black & White. It just didn't look right in colour. A lot of the Stones fans on that site were up in arms, asking for it to be removed. I'm a bit of a purist when it comes to the old photos and I'd rather see them as they were intended to be, in B & W.
If you ever do come across any genuine coloured photographs of John Eddleston's I would love to see them. like a kid with a box of crayons - I love it. I'm currently trying to go through my family history and wondered if you knew where I would start. I'm on ancestry and I've gathered bits of info but it doesn't go into what their personal lives were like. Any advice. I'm dealing in the Blackburn, Heapey, Chorley at the moment. Hi elizabeth hannan , well loved the days when mum and took all thekids to the chippy at larkhill they was the days well miss every moment .